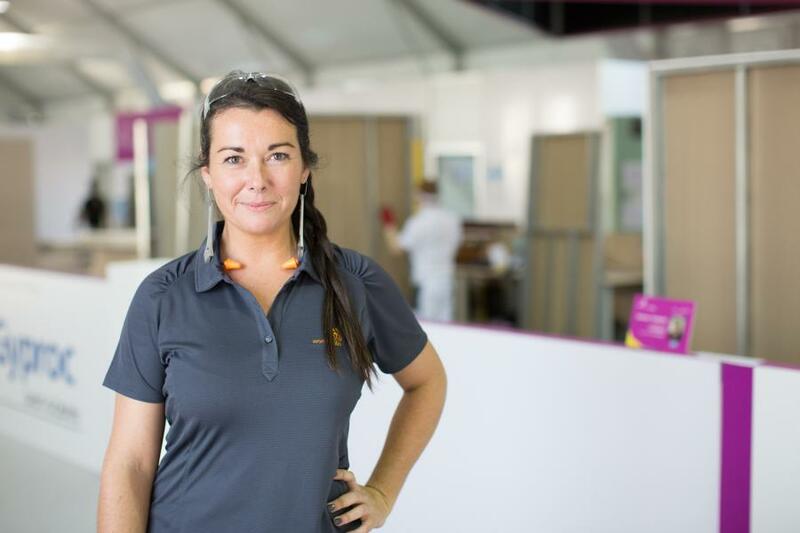 The Steel Erectors Association of America announced that Kayleen McCabe, the winner of DIY Network's Stud Finder competition and longtime host of TV's Rescue Renovation, will headline the association's 2019 convention program. The 47th Annual Convention and Trade Show will be held April 24 to 26, 2019, in Charlotte/Concord, N.C. McCabe is a licensed contractor and industry ambassador. Her work focuses on tightening the skills gap, encouraging women to enter a male-dominated field and showing alternative paths to the traditional college route. During her presentation, "Trades in the 21stCentury," she will share her story and discuss the need to restore dignity to crafts as a profession. "I starting taking the SAT, ACT in 7thgrade — on level with super nerd. All through high school it was AP classes, and college prep. But it wasn't anything that made me happy. As I was about to graduate, the counselor asked me what I was going to do. I said I wanted to be a welder. There is something magical about being under a hood…" said McCabe. After dropping out of college and taking a rambling career path that ultimately led her to a successful career in do-it-yourself television, McCabe learned yet another truth. "The fallacy of do-it-yourself TV shows is that it gives the impression that someone with no skill or training can remodel a kitchen in the time it takes to have a three-course meal. I'm a smart person, but I didn't get the Pythagorean Theorem until I was on a job site for the first time." "I want people to know that there are lifelong opportunities, and careers that blossom into other things in commercial and industrial construction. Yes, it takes training on par with a bachelor's degree," she said. But the benefits are that the money is great, and the work is rewarding, she explained. In addition to the keynote presentation by McCabe, attendees can attend other sessions for managers or field level personnel, visit the Trade Show where exhibitors will have live equipment demos, and participate in networking activities. Attendees also can participate in the George R. Pocock Memorial Golf Tournament, fishing on Lake Norman, the Gala Dinner and Awards Banquet at the Charlotte Motor Speedway Club, or the NHRA drag racing event at the conclusion of the convention. For more information or to register online, visit http://www.seaa.net/seaa-convention--trade-show.html. Employee Rescue Teams — Beyond 9-1-1. Brent Wise, co-owner and COO of Tech Safety Lines Inc., is a veteran of the Dallas Fire and Rescue Department. He will discuss employee-based rescue teams, creating a safety plan in emergency situations and how ERT training can create a quality rescue program. Rigging Refresher. Kevin Benner, rigging trainer and field sales representative of the Indusco division of Mazzella Lifting, will address often overlooked rigging problems. Selecting the Right Boom Lift for the Job. Craig Edwards, VP of national accounts of JLG Industries Inc., will speak about using aerial work platforms for steel erection and welding at height. He will share tips for maximizing productivity and safety, identifying the right people and equipment for the job, and understanding how new ANSI standards changes affect the jobsite and selection of equipment. Developing your Talent Pipeline. Gregg Schoppman, a principal with FMI Corp., specializes in best practices for productivity and project management, and was recognized as one of the Top 25 Consultants in 2014 by Consulting magazine. He will help attendees explore recruiting strategies, what to look for during the recruiting process, and how to discover common mistakes contributing to poor employee retention. Reskilling the Workforce of the Future. Peggy Smedley is an award-winning journalist,having just won the ASCE Excellence in Journalism Award for her achievements in enhancing the public's understanding of the impact of civil engineering. She will speak to labor opportunities the construction industry is missing, how contractors can entice Gen Z workers, and technology that reduces the worker shortage. Projects of the Year. Panel discussion and presentation of award-winning structural steel construction projects in four contract classes enlightens members as to some of the most creative, efficient, and dramatic work being done today. What's AISC been up to? Todd Alwood, director of certification of the American Institute of Steel Construction, will update attendees on programs, resources and market activities. From SpeedCore to tariffs to Student Steel Bridge Competition, and the latest AISC publications.